In this paper we describe the cognitive model that governs the forms and uses of the cyclic gesture, recurrent in a corpus of spontaneous German conversations. 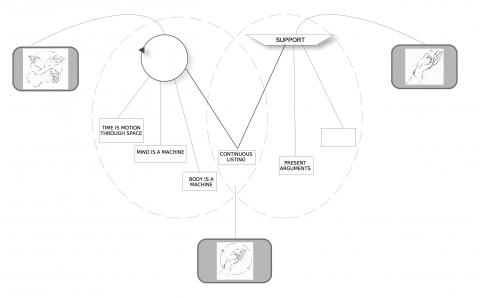 The gesture shows a stable form-meaning relationship: The continuous circular outward movement correlates with the semantic core of cyclic continuity in each context of use. On the basis of a thorough analysis of each of the 56 instances found in the data, we found that the cyclic gesture is not used randomly but distributed over a stable set of contexts of use showing a systematic variation of form and meaning. Furthermore, the analysis revealed that the image schema cycle, which the core of this gesture is reminiscent of, is metaphorically construed drawing on the metaphors mind is a machine, body is a machine, and time is motion through space. According to these findings, we argue for a shared underlying Idealized Cognitive Model (ICM, cf. Lakoff 1987) which functions as a model for thinking about and classifying cyclic events and guides the uses of this gesture. Via our study, we can give a new, semantic, perspective on the notion of gesture families. Cet article propose une description du modèle cognitif dont sont issus les formes et usages du geste cyclique, geste récurrent dans un corpus de conversations spontanées en allemand. Ce geste présente une relation forme-sens stable : au mouvement continu vers l’extérieur correspond un noyau sémantique de continuité cyclique, dans chacun des contextes où il est utilisé. Une analyse minutieuse de chacune des 56 occurrences rencontrées dans nos données montre que l’usage du geste cyclique n’est pas le fruit du hasard mais que sa distribution au sein d’un ensemble fini de contextes d’usage où s’illustrent des variations systématiques de la forme et du sens. De plus, l’analyse révèle que le schéma d’image du cycle, que rappelle le noyau sémantique du geste, reçoit ici une interprétation métaphorique élaborée à partir des métaphores : l’esprit est une machine, le corps est une machine, et le temps est déplacement dans l’espace. Sur la base de ces analyses, nous défendons l’idée d’un Modèle Cognitif Idéalisé (Idealized Cognitive Model, cf. Lakoff 1987) commun et sous-jacent à ces usages, qui fonctionnerait comme modèle pour conceptualiser et catégoriser les événements cycliques, et guiderait les usages de ce geste. Notre étude offre par conséquent une nouvelle perspective, de nature sémantique, sur la notion de familles de gestes. 2We want to focus on a recurrent gesture, the cyclic gesture,which is characterized by a continuous circular movement of the hand, performed away from the body, i.e. outward. The hand remains in situ, i.e., it is not moved forwards or sidewards during the performance of the circular motion (see Figure 1). The movement is perceived as a holistic gestalt as the individual circles are not accentuated at the lower trunk and therefore are not observed as discrete motions. 2 I am grateful to Mathias Roloff for providing the drawings (www.mathiasroloff.de). 3This gesture can be termed recurrent, since it is used repeatedly in different contexts and its formational and semantic core remains stable across different contexts and speakers. With respect to the cyclic gesture it was found that in all contexts of use the formational core of the continuous circular outward movement comes with the semantic core of ‘cyclic continuity’. 4 The cyclic gesture shows different ranges of meaning: The term “local meaning” refers to the meaning of a particular gestural instance in a video example. As the cyclic gesture is distributed over a stable set of contexts of use, each variant shows a particular context meaning (“meaning variant”), which is more abstract and general than the local meanings of the single instances (for a similar perspective see Brookes 2001, Sherzer 1991). The semantic core (“semantic theme” Kendon 2004) designates a basic meaning underlying all instances of the recurrent cyclic gesture. The core of the cyclic gesture and its form-meaning variants form the family of the cyclic gesture in which the members share semantic as well as form features. 5These findings suggest an underlying cognitive model in the sense of Lakoff 1987 into which the different uses of the gesture are integrated. This cognitive model, which is at the same time a “cultural model” (Williams 2004) as it is shared by German speakers, guides the uses of the cyclic gesture. We will show that cognitive processes such as image schema and conceptual metaphor work in the meaning-making process of the cyclic gesture. They are responsible for the integration and interrelation of the different uses of this gesture. 6Processes of conceptualization have been of interest in the field of gesture studies since 1992 when McNeill proposed that “gesture reveals a new dimension of the mind. This dimension is the imagery of language […] The coordination of [speech and gesture] gives us fresh insights into the processes of speech and language.” (McNeill 1992: 1) Since then, gestures have been described as a “window onto thinking“ (McNeill & Duncan 2000: 143). They were found to refer not only to concrete entities or events but also to abstract ones and to provide evidence of conceptual metaphors.3The underlying action of a gesture can provide the source domain of a metaphor. The meanings of the Palm Up Open Hand gesture (PUOH), for instance, can be reconstructed from the actions underlying it, namely giving, taking, presenting and holding an object (Kendon 2004, Müller 2004). The PUOH shows two basic meanings: The “presentation of discursive objects, which are suggested for agreement“ (Müller 2004: 252) or “presenting arguments and inviting to share perspectives“ (idem: 243). In this way, the concrete action of holding an object on the open hand and presenting it to an interlocutor is mapped onto the abstract domain discourse. 7More recently the notion of image schema (Johnson 1987) and motor patterns have been taken up in gesture studies. Since these “patterns emerge as meaningful structures for us chiefly at the level of our bodily movements through space, our manipulations of objects, and our perceptual interactions” (Johnson 1987: 29) it seems but a logical consequence to detect them in gestural forms. Although cognitive linguists provide different definitions of what they consider to be an image schema (see Hampe 2005b) and still discuss a possible “list” of image schemas (e.g., Clausner & Croft 1999, Deane 1992, Santibañez 2002) the definitions given so far led to their identification in gestures. Cienki (1998a) was the first to mention this concept with respect to gesture. Studying discourse on honesty, he was able to show that the image schema straight provides the basis for the source domain of the metaphor the moral person is straight which appears in gesture (idem: 128). In further studies he found that the image schemas container, cycle, force, object, and path can be used as descriptors for gestures and as such “provide common skeletal structures which underlie individuals’ seemingly idiosyncratic gestures” (Cienki 2005: 438). 8In more recent studies on image schemas and gestures, researchers found that gestures seem to be reminiscent of the more “basic” image schemas that belong to the spatial motion group. Mittelberg (2006, 2010) identified prominent hand shapes and motion patterns, which recurred across different subjects and speakers visualizing image schemas such as path, container or support when talking about grammatical concepts and theories. Bressem (2008b) identified image schemas in gestures on the basis of the four parameters ‘hand shape’, ‘orientation’, ‘movement’ and ‘position in gesture space’ (Battison 1974, Stokoe 1960). Based on a form-based description of co-speech gestures independent of speech, she reconstructed recurrent image-schematic patterns of at least two involved parameters as, for instance, in the realization of hand shape and orientation in a flat hand with a) the palmed upward (surface), b) palm sideward (vertical orientation) or c) palm downward (blockage). Furthermore, she found out that clusters of ‘parameter realizations’,4 i.e. the simultaneous realization of all four parameters, correlate with “clusters of image schemas” (Bressem 2008b) as some parameter realizations were found to be reminiscent of image schemas. Her findings confirm the property of groupings of image schemas, which was found for image schemas detected in speech (Cienki 1997). 9The notions of conceptual metaphor and image schema introduced above are basic to the study of linguistic phenomena from a cognitive-linguistic viewpoint. Since they are fundamental in the meaning-making processes of gesture as well, they will be considered in our analysis of the meaning and function of the cyclic gesture. 10The article is structured as follows. We first describe the data on which this study is based and the method we have used in our analysis (section 2.1). Next, in section 2.2, we analyse the semantic core of the cyclic gesture and present its image-schematic basis. Against the background of the underlying structure of the gestural core, we examine how it is modified in the different contexts of use (section 2.3). The different meanings of the cyclic gesture will be determined by looking at the interrelation of form, meaning and context. As the cyclic gesture is used metaphorically in 96% of the cases, we will focus on these metaphorical extensions of its underlying image-schematic structure. Finally, in section 3, we integrate the uses of the cyclic gesture and its possible origins into a metaphorical cycle ICM (Baldauf 1997, Lakoff 1987). This will allow us to reinterpret the notion of gesture family that has been introduced in the literature by Kendon (2004). 11In order to give an example of the cyclic gesture for each of the three contexts of use identified in the data, we need to briefly describe the method applied in the study. 12The analysis presented in the following is part of a larger usage-based study conducted in 2006. The study starts from a particular movement pattern, namely the continuous circular outward movement (Figure 1) that can be observed frequently in everyday German discourse. The data upon which the study is based consist of ten hours of naturally occurring every-day conversations between people who know each other (family relations, friends); altogether twelve German speakers (seven female and five male speakers) participated. The subjects were of all ages ranging from the age of 21 to the age of 80. These everyday conversations were video-taped, but the recordings were not prepared in advance, which basically means that the camera was set up when people held a conversation. The conversations were not restricted to a particular topic or task. Our concern was to collect data which are as natural as possible. A qualitative and bottom-up approach was chosen to detect forms and patterns of the gesture under investigation. The structures found in this gesture are based on the analysis conducted by the author alone; no inter-rater-reliability tests were conducted. 13The data was first sifted through without speech, during which phase all occurrences of the gestural form were noted down. After identifying all gestures exhibiting the formational core of a continuous circular outward movement, small video clips were created and imported into the annotation program ELAN,5 where the gestural forms were carefully re-examined. This analytical step was relevant as in some cases, the circular movement was halted for more than one video frame. In these cases, the movement pattern has to be considered discontinuous with two single gestures, each performing one circular movement (see also Seyfeddinipur 2006). This method resulted in a corpus of 56 cyclic gestures. 14Following this revision of each gestural form, the clips were inspected with the accompanying speech in order to determine the gestures’ “contexts of use” (Kendon 2004, Müller 2004, Scheflen 1973), which is broadly defined as the discursive situation in which the gesture occurs. Basically, we determined the speech activity that the speaker conducted while s/he was using the cyclic gesture. As will be detailed below, the data contains three different contexts in which the cyclic gesture was used by more than one speaker. 15After the determination of the different contexts of use, the gesture phases of the cyclic gestures were annotated following Kendon (1980) and Bressem & Ladewig (in press). The identified gesture phases were further described in a form-based analysis irrespective of speech which follows a 3-step procedure (Ladewig & Bressem under review). Annotation and analysis are not considered as independent steps but as going hand in hand with each other. The first two steps deal with the gestural form and the meaning it conveys. The third step includes the verbal context of the gesture and explores the relation between these two modalities. For all three steps, it is proposed not to lose sight of the interrelation of the gestural form and its (possible) meaning(s). 16First the gestural form was analysed. In order to do so, the four parameters ‘hand shape’, ‘orientation’, ‘movement’, and ‘position in gesture space’ were described with the sound switched off. These parameters were first introduced into the study of sign language (Battison 1974, Stokoe 1960, 1972) and were later adapted to the analysis of gestures (e.g., Becker 2004, Bressem 2008a, Ladewig 2010, Poggi 2002, Sparhawk 1978, Webb 1998). The parameter ‘movement’ was further described in terms of ‘size’, defined with respect to the body parts involved, i.e., forearm, hand, single fingers, and the stretching of these parts,6 and ‘number of rotations’. For the notation of the orientation of the palm as well as the position in gesture space we used the notation conventions introduced by McNeill (1992; see Figure 2). In addition, we annotated handedness and gaze. 17In a second step, we determined the “rudimentary meaning”7 of the cyclic gesture (idem). In this analytical step first hypotheses on the semantics of the gesture were formulated. We pursued a reconstruction of a possible meaning conveyed by the form only, detached from its verbal context. Our assumptions were accompanied by considerations on the meanings of circular movements visible in the world. Based on these reflections we determined which motor patterns, geometric patterns and/or image schemas are involved and whether the core of the cyclic gesture is reminiscent of an action or an image schema or both. 18In the third step the form-meaning analysis was related to the verbal utterance. Every example was analysed with respect to its local meaning from which the meanings of the context variants were abstracted. Furthermore the assumptions on the meaning of the gestural core (step 2) were substantiated by the exploration the gesture-and-speech ensembles. In addition, the form-based analysis and the context-of-use analysis were related to each other to figure out whether the contextual variants align with specific parameters described above. 19Before illustrating each context of use in the data, we describe the formal and semantic core of the cyclic gesture, revealing its cognitive basis. Starting from the formational core of the cyclic gesture we reconstructed where this gesture “originates from (“common origin“, Müller 2004). In doing so, underlying actions (see also Kendon 1995, 2004; Müller 2004; LeBaron & Streeck 2000; Teßendorf 2008) as well as image schematic structures are taken into account. Our analysis revealed that the image schema CYCLE (Johnson 1987) provides the cognitive basis for the cyclic gesture. The formational core is reminiscent of the cycle as it “begins with some initial state, proceeds through a sequence of connected events, and ends where it began to start anew” (idem: 119). The semantic core also shares properties with this image schema since the cyclic gesture was found to be related to ongoing events in every instance. As the cycle can constitute the basis for the conceptualization of cyclic time we concluded it to be the driving force behind the semantic core of the cyclic gesture. 20In the many instances of the cyclic gesture found in the data, the image schema cycle is involved in metaphorical mappings as, for instance, in the time-is-motion-through-space metaphor, the body-is-a-machine and the mind-is-a-machine metaphor. The metaphoric extension of the gestural core will be spelled out in the following. 22As the frequencies (mentioned between brackets) show, the context of the word or concept search is the primary context of the cyclic gesture; since there is only one example of an enumeration, this context has not been considered in the present study. For the three remaining contexts, discussed in more detail below, the cyclic gesture was used by more than one speaker. during a phase of fluent speech after the search. 24Whereas in the first sequential position the cyclic gesture represents the ongoing searching activity,8 the three subsequent ones show the recovery of speech fluency. Cyclic gestures used in these sequential positions express the continuation of what has been going on before the search. As the cyclic gesture is used in 65 % of the cases in the first sequential position, the meaning of this contextual variant represents the ongoing searching activity. 25In the following example (Figure 3 and 4), the cyclic gesture is used in the first sequential position. The example is taken from a conversation between three women talking about movies. The acting qualities of a famous Hollywood actor are brought up to the conversation in the following. 26The speaker Me agrees with her interlocutor concerning the performance of the actor they are talking about by using the affirmative particle ja (‘yes’, Figure 4, line 2, 2a). In what follows she starts to search for the concept art und weise (way of doing) in order to account for her affirmation. The searching process becomes manifest in a reformulation announced by the reformulation indicator also (“that means”, Figure 4, line 2, 2a). 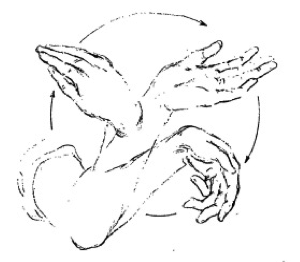 The stroke of the cyclic gesture is executed during a pause of 0.5 sec (Figure 4, lines 2-3). As such, no idea is expressed in speech to which the gesture is related. Put differently, the gesture does not depict iconically something mentioned verbally. It rather works on a meta-communicative level presenting the searching process for the concept art und weise (way of doing) that is in progress. 27In this example, the cyclic gesture is used metaphorically. The mental activity of searching, which can be considered as an outcome of the working mind, is conceptualized as a circuit. The mind-is-a-machine metaphor (Lakoff & Johnson 1980) works in this example, more specifically the metaphor searching is a process in a machine. 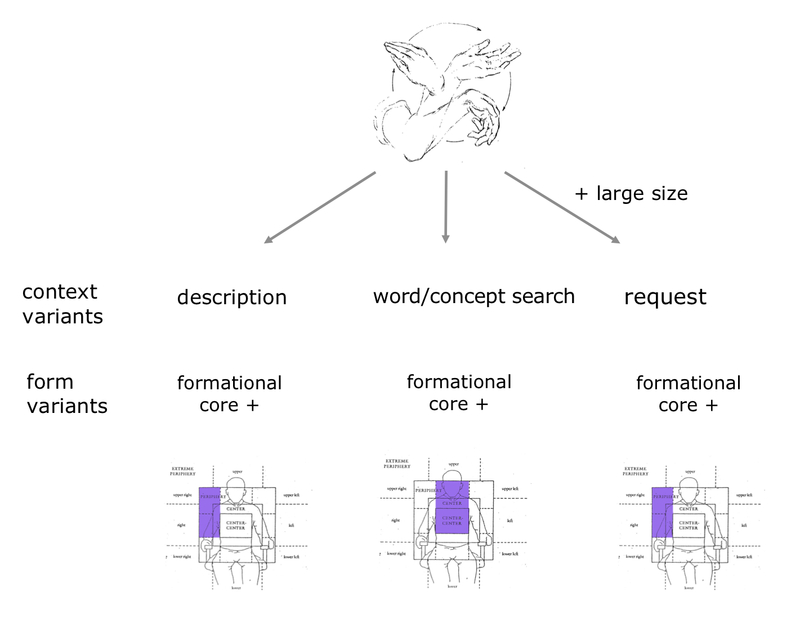 The continuous nature of the searching activity is represented by the formational core of the cyclic gesture. In this way, the metaphor time is motion through space (see e.g., Clark 1973, Gentner 2001, Evans 2004, Lakoff 1993, Lakoff & Johnson 1980) is expressed in the gesture as well. The image schema cycle is metaphorically projected onto both abstract domains, mind and time, becoming “ex-bodied” (Mittelberg 2010) in the gesture. 28The local meaning of searching for the concept art und weise (way of doing) comes with additional parameter realizations: The formational core is performed with an open hand oriented towards the speaker’s body. The hand is located in the central gesture space (see Figure 2). The position of the hand shows that the metaphors mentioned above are used to conceptualize the speaker’s own (speech) activity. As this variant is positioned in the central or personal gesture space (see e.g. Sweetser & Sizemore 2008) it is rather directed toward the speaker herself than to her interlocutor. It can thus be interpreted to represent such activities that the speaker is dealing with at the very moment of gesturing. 10 The strokes are performed on the underlined segments of the utterances. 29Further examples are listed in the following.10 They all show the use of the cyclic gesture during a phase of non-fluent speech. Die Mischung dieser anglosächsischen Kultur und der ‘s französischen und der amerikanischen:: a:uch da:: Kultur ne? The mixture between the Anglo-Saxon culture and the French and the American:: also: the::re culture right? Und dann dis is o:b w:: weißt du. Das widerspricht sich irgendwo: also. And then this is i:f y:: you know. It contradicts someho:w well. Er meinte ich soll das das selbe ge- also:: gelbe Papier, das is doch son komisches gelbliches Papier. He supposed that I should the the same ye- we::ll yellow paper, this is such a strange yellow paper. Weil da is doch dieser von privat (0,5s) und ich hab äh in in in der Zeitung ganz viele Lehnbachstraße von im Hausverwaltungen. Äh. Because there is this from private (0.5sec) and I have eh in in in the newspaper a lot of Lehnbachstreet from in building managements. Eh. 30The cyclic gesture in the contexts of descriptions is used with a “referential function” (Müller 1998) as it visualizes semantic aspects of circular movements such as scooping, or of ongoing events such as thinking processes. In most cases, i.e. in 10 out of 12 instances, the cyclic gesture was used to refer to abstract entities, which is why we posit that the meaning of this context variant is to represent ongoing processes. 31The following example (Figure 5 and 6) is taken from a conversation between three women talking about movies. Speaker Me mentions a movie she recently saw in the movie theatre. She remarks that in order to fully understand the movie one has to mentally combine the details the movie is composed of. 32The formational core, which is the stroke of the cyclic gesture (Kendon 1980), can be observed on the phrase selber kombiniern kannst (‘can combine yourself’; see Figure 6, line 1, 1b). As the cyclic gesture is verbally accompanied by the verb ‘combine’ we can conclude that this gesture is related to this verb and represents the combining of details as an activity that is in progress. The semantic core of cyclic continuity is reflected in the formational core of the continuous circular outward movement. The local meaning of a particular mental activity, namely the combining of details, is realized with further parameters: in this example, the right hand with a stretched index finger is used. The movement is anchored at the wrist, which corresponds to a medium movement size. The palm is oriented down and located in the right peripheral gesture space next to the temple (Figure 2 and 5). By pointing at her head the speaker shows that something located in her head is in progress. Combined with the verbal utterance, we can conclude that the speaker refers to an ongoing mental activity. The representation of the thinking process as a continuous activity is thus expressed only gesturally, not verbally. 33 Form, meaning and verbal context of the cyclic gesture in this example refer to combining something as a mental activity or process. Two metaphors come into play in this example: The mind-is-a-machine metaphor, or more specifically, the metaphor thinking is a process in a machine underlies the conceptualization and presentation of mental operations as circuits. As circuits work continuously, represented by the circular movement, the metaphor time is motion through space is also expressed gesturally in this example. 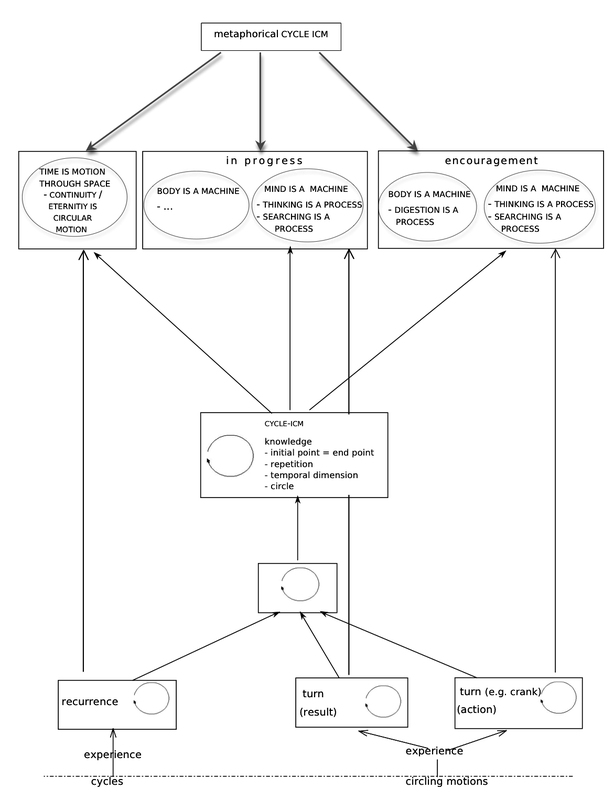 As in the previous example, the image schema cycle is construed in both of these metaphors. But note that by using the cyclic gesture, no development or evolution of thought is presented in the sense of achieving a result. The latter would demand for a movement forwards or sidewards. Thus using the cyclic gesture makes a differentiation possible, very easily, which is not made in speech. 34Further examples illustrating the cyclic gesture in the context of descriptions are listed below. Schöpfen ist doch wie als wenn du was was als wenn du was abschöpfst im Prinzip. Ich will intellektuell das Niveau weiter fortführen. Intellectually I want to continue on this level. Ich hatte das schon mal an einem anderen Zahn. Da hat sie ewig rumgemacht. I’ve had this already on another tooth. She was trying endlessly. Dadurch ist mir erst bewusst geworden wie hart ich da drauf bin. Through this I became aware of how emotionally bitter I was. 35The cyclic gesture used in the context of a request fulfills a “performative function” (Müller 1998) as it performs a type of speech act or “interactional move” (Kendon 1995: 267). It is used to “act upon the behavior of others” (Teßendorf 2008) by inviting the interlocutor to continue an ongoing (speech) activity. 36The following example is taken from a parlor game called “Tabu”, which is a guessing game. In this example, speaker Su describes an item to her game partner. When doing so, she is not allowed to use the words written on the card she is holding in her left hand (Figure 7 and 8). 37The term that the speaker’s game partners have to guess is ‘justizvollzugsanstalt’ (‘penal institution’). Speaker Su mentions first the German abbreviation jva (see Figure 8, line 1, 1a) whereupon her game partner, speaker Ma, answers jugendvollzugsanstalt (literally: “youth institution”). He seems to be close to guessing the term right since speaker Su affirms his answer by means of the affirmative particle ja (“yes”, Figure 8, line 1, 1a). In the following discourse, the cyclic gesture is executed while the speaker is verbalizing the question was ist das (“what is it”) and the subsequent request ein andres wort (“another word”, see Figure 8, lines 1-2 for the exact position of the stroke). Accordingly, the speaker requests her game partner verbally as well as gesturally to continue his speech activity – the search for the right term. 38What we can conclude from this is that again the cyclic gesture does not relate to a subject matter conveyed in speech, meaning it does not depict iconically something mentioned verbally. It is used to encourage the interlocutor to continue his searching process or to “crank up” his activity. The semantic core of the cyclic gesture becomes manifest in the continuous cranking motion. Note that the gesture does not re-enact the action of holding a crank and turning it but conducts a gestural action itself (see Teßendorf 2008). It represents the motion of a crank rather than to re-enact the action of cranking. As such, the mind-is-a-machine metaphor is expressed in this example. The action of cranking, which can also be considered as an origin for the constitution of the image schema cycle, serves as the source domain of this metaphor. The speech activity of guessing and searching for the right term is conceptualized as a process in a machine, which can be cranked up in order to keep it going. 39As described in the examples above, the local meanings of the cyclic gesture come with additional parameter realizations. In this example, the hand is open and the palm is oriented laterally towards center (Figure 7). It is positioned in the right periphery of the speaker’s gesture space and executed with a large movement size. These two parameters realizations add a deictic component to this variant (see also Bavelas et al. 1992) which leads to the conclusion that the cyclic gesture is not directed to the speaker but to the interlocutor. The meaning of this context variant is to continuously crank up the interlocutors speech activity. As this context variant is the most specialised, its field of application is not as broad as the one of the cyclic gesture used in descriptions. 40In the following further examples are listed to illustrate the context of requests. Man sagt dazu? (0,25s) Anderes Wort. Eingeborene. It is called? (0.25sec) Another word. Natives. Was ist in Indien? Da ist doch ein bestimmtes hohes (0,3s)? What is in India? There is a certain high (0.3sec)? Man kann drin schlafen. Es ist (0,3s)? You can sleep in it. It is (0.3sec)? Das sind Arbeiter die, die Frauen anmachen draußen. Das sind typische? These are workers that flirt with women outside. These are typical? 42Since determining one typical position in the gesture space resulted in an unclear listing of different positions, they were combined into arrays such as “periphery upper center to center center” (central gesture space, see Figure 2). All variants of the cyclic gesture show a characteristic position in gesture space. Whereas the cyclic gesture used in the context of descriptions was preferably positioned in the right peripheral gesture space (7 out of 12 cases, 60%) the cyclic gesture in the context of a word/concept search preferred the central gesture space (31 out of 37 instances, 84%). The cyclic gesture used in the context of a request is positioned in the same gesture space as the cyclic gesture in descriptions (4 out of 6 cases, 60%). However it was used with a large movement size, meaning that the movement was anchored at the elbow (5 of the 6 cases, 80%). These findings support a systematic variation of form and context. 43Movement size and position in gesture space are the parameters that contribute to the emergence of gestural variants on the level of form. Their particular realizations recur with the context variants identified in the data and reflect their pragmatic functions. The cyclic gesture used in requests fulfils a performative function as it “cranks up” the interlocutor’s ongoing searching activity. Its illocutionary force becomes manifest in the large movement size and in the right peripheral gesture space. Both reflect the deictic component of this variant, i.e. the direction towards and the addressing of the speaker’s interlocutor (see also Bavelas 1992). In the case of the cyclic gesture used in the context of a word/concept search, the position in the central or “personal gesture space” (see e.g., Sweetser & Sizemore 2008) suggests that this variant is rather directed toward the speaker her/himself. In the case of the cyclic gesture used in the context of descriptions the gesture space is used iconically (“referent space”, Sowa 2006) or as a means to direct the gesture towards the interlocutor. 44The previous sections have detailed the form(s) and meaning(s) of the cyclic gesture and their contexts of use. Moreover, we described the operations involved in the meaning-making process of this gesture. The question that remains to be answered is: How is it possible that one and the same movement pattern can represent thinking, searching and cranking? The following section suggests a cognitive model, a metaphoric cycle ICM that guides the uses of the cyclic gesture and can be seen at work in the different uses. ICMs are proposed as a way in which we organize knowledge, not as a direct reﬂection of an objective state of affairs in the world, but according to certain cognitive structuring principles. The models are idealized, in that they involve an abstraction, through perceptual and conceptual processes, from the complexities of the physical world. At the same time, these processes impart organizing structure—for example, in the form of conceptual categories. 46The cycle ICM that we present below integrates the different context variants of the cyclic gesture and shows the interrelation of its possible bases and abstract meanings. As gestures have a basis in bodily experiences12 we not only describe the metaphorical uses of the cyclic gesture but also its possible origin. We argue that these origins contribute to both the emergence of the image schema cycle but also to a direct metaphorical mapping of an action to an abstract domain, for instance. 47The ICM that underlies the use of the cyclic gesture consists of the image schema cycle and its metaphoric projections brought forth in the different uses of this gesture (Figure 10). The image schema cycle has emerged from the abstraction of our experience of recurrent events, conceptualised as cyclic, such as breathing, the four seasons, or the tides, but also on the perception of circling objects (e.g., a turning wheel) or actions (e.g., cranking or pedalling). The cycle can be said to constitute a “central, basic definition” (Schroeder 2006: 196) since “image schemas serve to organize and represent characteristic perceptual-motor patterns to form a semantic core on which higher-level cognition rests.“ (St. Amant et al. 2006: 1, italics in the original) Basic knowledge about circles, cyclic temporal events, or recurrence combines with the image schema cycle and gives rise to an image-schematic ICM. This again is projected onto abstract domains by way of metaphor in order to conceptualize concepts such as thinking, process, or continuity (see Figure 10). These concepts can be metaphorically construed by way of the metaphors the mind is a machine, the body is a machine14or time is motion through space. The different variants of the cyclic gesture serve as single components of the ICM. In the examples presented above, the metaphors time is motion through space and mind is a machine were expressed through the gestures. The latter can be differentiated with respect to the notion of being in progress and being encouraged. Whereas the cyclic gesture used in descriptions as well as in word/concept searches (re)presents processes that are in progress, the cyclic gesture used in requests is used to encourage processes, i.e., to request the interlocutor to continue an ongoing (speech) activity. The fact that the concrete action of cranking has a strong influence on the meaning and function of this variant is represented by an arrow that links action with metaphor (Figure 10). Whether the image schema or the action of cranking is directly mapped onto the abstract domain of mind or body is not so easy to decide. The function of cranking up someone else’s (speech) activity would certainly speak for a direct metaphorical mapping of an action onto the abstract domains. However, the “mimetic mode” (Müller 1998, 2010a) and the gestural form should then be different: The gesture should re-enact the holding of a handle and move it (“acting mode”, idem). As this variant was always performed with a loose, open hand, the cyclic gesture rather represents the movement of a circling object like a crank (“representing mode”, idem). These observations favour the idea that some kind of abstraction must have taken place and that the action is not directly mapped onto the domains mind or body. 48In all instances of the cyclic gesture, the image schema cycle is ex-bodied in the formational and semantic core. In other words, cyclic continuity is present in all contexts of use. While the gestures are semantically related, they are used recurrently in different contexts with additional parameter realizations and meanings, representing different aspects of the underlying ICM. 49Recurrent gestures have been examined from different cultural backgrounds by various gesture researchers.15Some of these recurrent gestures were also defined as gesture families (Kendon 2004, Müller 2004). A gesture family not only “shares a distinct set of kinesic features but each is also distinct in its semantic themes. The forms within these families, distinguished as they are kinetically, also tend to differ semantically […]” (Kendon 2004: 227) Accordingly a gesture family is first and foremost characterized by a formational and semantic core. However, what is crucial for considering a recurrent gesture to be a gesture family is variation. The term can be applied only to such recurrent gestures that show variation of form, meaning and context. The variants of a recurrent gesture are defined as members of a gesture family. These criteria also apply for the cyclic gesture, which can be defined as a gesture family as well. 50The notion of a gesture family is quite useful in order to group the different variants of a recurrent gesture and reveal that these belong to the same core.However, it does not answer the question of what cognitive processes might be involved in the meaning-making process. More specifically, it does not put forward the idea that the variants, which are related to each other by way of one formational and semantic core, are also cognitively related to each other. 52Cognitive models are interrelated, “forming webs of mutual support and constraint” (idem). Evidence for such an interrelation can also be found with respect to gestures. The combination of two (or more) formational cores and their associated semantic cores has been described as the “marriage of two gesture families” (Becker & Müller 2005, see also Becker 2004, Ladewig 2006) or “complex kinaestheme” (Fricke 2008).What results from such a combination are variants of gesture families (see Figure 11). Although, the term “marriage of gesture families” is a little misleading as not the whole families are combined but only their cores, we get the idea that gestural forms can be combined in order to form new meaning. An example is the combination of the PUOH and the cyclicgesture resulting in a gesture that continuously presents something, like arguments, for instance (Müller 2004). Taking the underlying cognitive processes into account, we suggest that the combination of the gestural cores resulting in the formation of gestural variants is possible because the underlying cognitive models are related to each other. Argued from the perspective of gesture studies the cores of the recurrent cyclic gesture and the PUOH are “fused”and remain variants of both (Figure 11). As such, the PUOH performed with a continuous circular outward movement forms a variant of both the family of the PUOH as well as the family of the cyclic gesture. 53This combination of gestural cores provides multimodal evidence for the interrelation of conceptual models if one presupposes that icms underlie the uses of (recurrent) gestures as it is done for categories such as bachelor, for instance (Lakoff 1987). 54The study situates itself not only within the discussion of recurrent gestures but first and foremost within the discussion of a multimodal perspective of language. It also adds to the debate on the embodiment of meaning and provides further challenges for the cognitive-linguistic approach to language by raising further questions as for instance: If we assume that the uses of recurrent gestures are structured by underlying cognitive models, how are these models organized? Do they build some kind of a lexicon? And with respect to cognition in general, we need to approach the question of how cognitive models underlying the verbal languages and those underlying recurrent gestures interact. 55The study of gestures not only provides additional evidence for the cognitive reality of image schemas, conceptual metaphor or ICMs; it also adds to the cognitive-linguistic adventure of analysing the relation of bodily experience, thought and its materialization. Baldauf, C. 1997. Metapher und Kognition: Grundlagen einer neuen Theorie der Alltagsmetapher. Frankfurt am Main: Peter Lang. Barcelona, A. 2000. Metaphor and metonymy at the crossroads: a cognitive perspective. Berlin: Mouton de Gruyter. Battison, R. 1974. Phonological deletion in American Sign Language. Sign language studies 5: 1-19. Bavelas B.J., N. Chovil, D.A. Lawrie & A. Wade. 1992. Interactive Gestures. Discourse Processes 15: 469-489. Becker, K. 2004. Zur Morphologie redebegleitender Gesten. Freie Universität Berlin, unpublished MA thesis. Becker, K. & C. Müller. 2005. Cross-classification of gestural features – the marriage of two gesture families. Paper presented at the 2nd conference of the International Society of Gesture Studies (ISGS). École normale supérieure Lettres et Sciences humaines, Lyon. Bressem, J. 2006. Formen redebegleitender Gesten – Verteilung und Kombinatorik formbezogener Parameter. Freie Universität Berlin, Unpublished MA thesis. Bressem, J. 2008b. Clusters of image schematic patterns in gestures. Paper presented at the 2nd UK-CLA conference, University of Brighton. Bressem, J. & S.H. Ladewig. in press. Rethinking gesture phases – articulatory features of gestural movement? Semiotica 184: 53–91. Brookes, H. 2001. The case of the clever gesture. Gesture 1: 167-184. Calbris, G. 2003. From cutting an object to a clear cut analysis. Gesture as the representation of a preconceptual schema linking concrete actions to abstract notions. Gesture 3: 19-46. Cienki, A. 1997. Some properties and groupings of image schemas. In : Verspoor, K. D. L. & E. Sweetser (eds.) Lexical and Syntactical Constructions and the Construction of Meaning. Amsterdam/Philadelphia: Benjamins, 3-15. Cienki, A. 1998a. Straight: An image schema and its metaphorical extensions. Cognitive Linguistics 9: 107-149. Cienki, A. 1998b. Metaphoric gestures and some of their relations to verbal metaphorical expressions. In Koenig, J.-P. (ed.) Discourse and Cognition: Bridging the Gap.Stanford, CA: CSLI, 189-204. Cienki, A. 2005. Images schemas and gesture. In : Hampe, B. (ed.) From Perception to Meaning: Image Schemas in Cognitive Linguistics. Berlin/New York: Mouton de Gruyter, 421-442. Cienki, A. 2007. 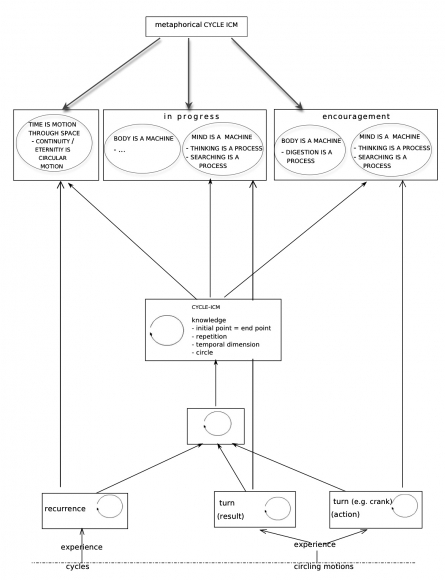 Frames, idealized cognitive models, and domains. In : Geeraerts, D. & H. Cuyckens (eds.) The Oxford Handbook of Cognitive Linguistics. New York: Oxford University Press, 170-187. Cienki, A. & C. Müller. 2008. Metaphor and Gesture. Amsterdam: Benjamins. Clark, H. 1973. Space, time, semantics, and the child. In : Moore, T. E. (ed.) Cognitive development and the acquisition of language. New York: Academic Press, 27-63. Clausner, T.C. & W. Croft. 1999. Domains and image schemas. Cognitive Linguistics 10: 1-31. Deane, P.D. 1992. Grammar in Mind and Brain: Explorations inCognitive Syntax. Berlin: de Gruyter. Evans, V. 2004. The structure of time language, meaning, and temporal cognition. Amsterdam/Philadelphia: John Benjamins. Fricke, E. 2008. Grundlagen einer multimodalen Grammatik des Deutschen: Syntaktische Strukturen und Funktionen. European University Viadrina, Frankfurt (Oder), Habilitation thesis (to be published in 2011, de Gruyter). Gentner, D. 2001. Spatial metaphors in temporal reasoning. In : Gattis, M. (ed.) Spatial schemas in abstract thought. Cambridge, MA: MIT Press, 203-222. Gibbs, J., W. Raymond & H.L. Colston. 1995/2006. The cognitive psychological reality of image schemas and their transformation. In : Geeraerts, D. (ed.) Cognitive linguistics: basic readings. Berlin: Mouton De Gruyter, 238-268. Gibbs, R.W. 1994. The poetics of mind: figurative thought, language, and understanding. Cambridge [England], New York, NY, USA: Cambridge University Press. Hampe, B. 2005a. From Perception to Meaning: Image Schemas in Cognitive Linguistics. Berlin/New York: Mouton de Gruyter. Hampe, B. 2005b. Image schemas in Cognitive Linguistics: Introduction. In : B. Hampe (ed.) From Perception to Meaning: Image Schemas in Cognitive Linguistics. Berlin/New York: Mouton de Gruyter, 2-12. Johnson, M. 1987. The body in the mind. The bodily basis of meaning, imagination, and reason. Chicago, IL: University of Chicago. Johnson, M. 2005. The philosophical significance of image schemas. In : Hampe, B. (ed.) From Perception to Meaning: Image Schemas in Cognitive Linguistics. Berlin/New York: Mouton de Gruyter, 15-33. Kendon, A. 1980. Gesticulation and speech: two aspects of the process of utterance. In : Key, M.R. (ed.) Nonverbal Communication and Language. The Hague: Mouton, 207-227. Kendon, A. 1988. How gestures can become like words. In : Poyatos, F. (ed.) Crosscultural Perspectives in Nonverbal Communication. Toronto: C. J. Hogrefe, Publishers, 131-141. Kendon, A. 1995. Gestures as illocutionary and discourse structure markers in Southern Italian conversation. Journal of Pragmatics 23: 247-279. Kendon, A. 2004. Gesture. Visible action as utterance. Cambridge: Cambridge University Press. Kopp, S., P. Tepper & J. Cassell 2004. Towards integrated microplanning of language and iconic gesture for multimodal output. Proceedings of the 6th international conference on multimodal interfaces. State College, PA, USA: ACM, 97-104. Ladewig, S.H. 2006. Die Kurbelgeste–konventionalisierte Markierung einer kommunikativen Aktivität. Freie Universität Berlin, Unpublished MA thesis. Ladewig, S.H. 2010. Beschreiben, suchen und auffordern – Varianten einer rekurrenten Geste. Sprache und Literatur 41: 89-111. Ladewig, S.H. & J. Bressem. under review. New insights into the medium hand. Discovering structures in gestures based on the four parameters of sign language. Lascarides, A, & M. Stone 2006. Formal semantics for iconic gesture. In : Schlangen, D. & R. Fernandez (eds.) brandial’06 Proceedings. Potsdam: Potsdam University Press, 64-71. Lakoff, G. & M. Johnson. 1980. Metaphors We Live By. Chicago/London: Chicago University Press. LeBaron, C. & S. Jürgen. 2000. Gestures, knowledge, and the world. In : McNeill, D. (ed.) Language and Gesture. Cambridge: Cambridge University Press, 18-138. McNeill, D. 1992. Hand and mind. What gestures reveal about thought. Chicago: University of Chicago Press. McNeill, D. 2005. Gesture and Thought. Chicago: University of Chicago Press. McNeill, D. & D.D. Susan. 2000. Growth points in thinking-for speaking. In : McNeill, D. (ed.) Language and Gesture. Cambridge: Cambridge University Press, 141-161. Mittelberg, I. 2006. Metaphor and Metonymy in Language and Gesture: Discoursive Evidence for Multimodal Models of Grammar. Cornell University, Unpublished doctoral thesis. Mittelberg, I. 2010. Geometric and image-schematic patterns in gesture space. In : Evans, V. & P. Chilton (eds.) Language, Cognition, and Space: The State of the Art and New Directions. London: Equinox, 351-385. Müller, C. 1998. Redebegleitende Gesten: Kulturgeschichte, Theorie, Sprachvergleich. Berlin: Arno Spitz. Müller, C. 2004. Forms and uses of the Palm Up Open Hand: A case of gesture family? In : Müller, C. & R. Posner (eds.) The semantics and pragmatics of everyday gestures. Berlin: Weidler, 233-356. Müller, C. 2008.Metaphors dead and alive, sleeping and waking: a dynamic view. Chicago: University of Chicago Press. Müller, C. 2010a. Mimesis und Gestik. In : Koch, G., C. Voss & M. Vöhler. (eds.) Die Mimesis und ihre Künste. Paderborn: Fink, 149-187. Müller, Cornelia 2010b. Wie Gesten bedeuten. Eine kognitiv-linguistische und sequenzanalytische Perspektive. Sprache und Literatur 41 : 37-68. Neumann, R. 2004. The conventionalization of the ring gesture in German discourse. In : Müller, C. & R. Posner (eds.) The semantics and pragmatics of everyday gestures. Berlin: Weidler, 217-223. Panther, K.-U. & G. Radden. 1999. Metonymy in Language and Thought.Amsterdam/Philadelphia: John Benjamins. Poggi, I. 2002. Symbolic gestures: The case of the Italian gestionary. Gesture 2: 71-98. Santibañez, F. 2002. The object image-schema and other dependent schemas. Atlantis 24: 16-49. Scheflen, A.E. 1973. How behavior means. New York: Gordon and Breach. Selting, M., P. Auer, B. Barden, J.R. Bergmann, E. Couper-Kuhlen, S. Günther, C. Meier, U.M. Quasthoff, P. Schlobinski & S. Uhmann. 1998. Gesprächsanalytisches Transkriptionssystem (GAT). Linguistische Berichte 173: 91-122. Sherzer, J. 1991. The Brazilian Thumbs-Up Gesture. Journal of Linguistic Anthropology 1: 189-197. Schroeder, H. 2006. The Meaning of "Nature": Insights from Cognitive Linguistics. In : Proceedings of the 2005 northeastern recreation research symposium. Northeastern Research Station. Seyfeddinipur, M. 2004. Meta-discursive gestures from Iran: Some uses of the 'Pistol Hand'. In : Müller, C. & R. Posner (eds.) The semantics and pragmatics of everyday gestures. Berlin: Weidler, 205-216. Seyfeddinipur, M. 2006. Disfluency: Interrupting Speech and Gesture. MPI Series in Psycholinguistics 39. Sowa, T. 2006. Understanding coverbal iconic gestures in object shape descriptions. Berlin: Akademische Verlagsgesellschaft Aka GmbH. Sparhawk, C. 1978. Contrastive-Identificational Features of Persian Gesture. Semiotica 24: 49-86. St. Amant, R., C.T. Morrison, Y.-H. Chang, P.R. Cohen & C. Beal. 2006. An Image Schema Language. In : Proceedings of the International Conference on Cognitive Modelling (ICCM 2006). Stokoe, W. C. 1960. Sign Language Structure. Buffalo, NY: Buffalo Univ. Press. Stokoe, W. C. 1972. Semiotics and Human Sign Languages. The Hague: Mouton. Sweetser, E. 1998. 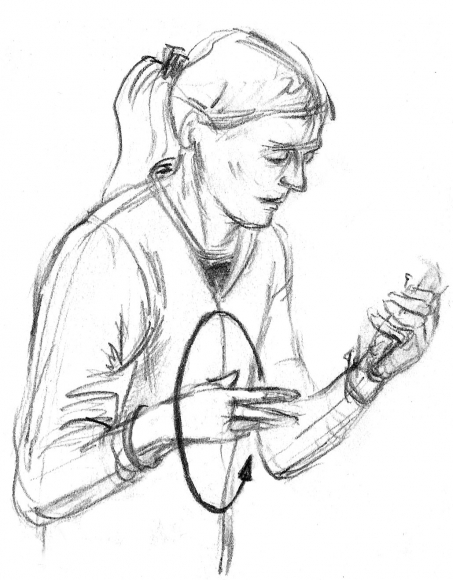 Regular metaphoricity in gesture: bodily-based models of speech interaction. In : Actes du 16e Congrès International des Linguistes (CD-ROM), Elsevier. Sweetser, E. & M. Sizemore. 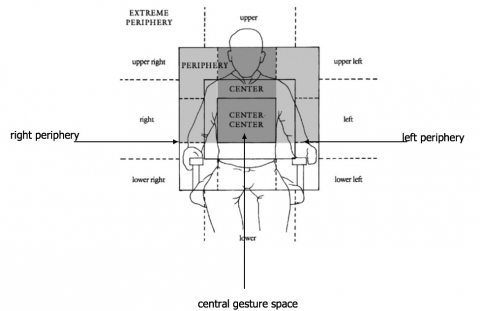 2008.Personal and interpersonal gesture spaces: Functional contrasts in language and gesture. In : Tyler, A. , Y. Kim & M. Takada (eds.) Language in the Context of Use: Cognitive and Discourse Approaches to Language and Language Learning. Berlin: Mouton de Gruyter, 25-52. Teßendorf, S. 2008. Pragmatic and metaphoric gestures – combining functional with cognitive approaches. Unpublished manuscript. Webb, R. 1998. The lexicon and componentiality of American metaphoric gestures. In : Santi, S., I. Guaitella, C. Cavé & G. Konopczynski (eds.) Oralité et gestualité: communication multimodale, interaction. Paris: L’Harmattan, 387-391. Williams, R.F. 2004. Making Meaning from a Clock: Material Artifacts and Conceptual Blending in Time-telling Instruction. University of California, San Diego. 1 This article was partly supported by the VW-foundation funding the project “Towards a grammar of gesture – evolution, brain, and linguistic structures”. I would like to thank Cornelia Müller for her support and encouragement during the conduction of the study. Special thanks go to Jana Bressem & Sedinha Teßendorf for inspiring discussions on the nature of the cyclic gesture and their fruitful comments on earlier versions of this paper. I am grateful to the anonymous reviewers for their helpful criticism and to Maarten Lemmens for his valuable comments and editorial work. 3 See, inter alia, Cienki 1998b, 2008, Cienki & Müller 2008, McNeill 1992, 2005, Mittelberg 2006, 2010, Müller 2004, 2008, Sweetser 1998, Webb 1998. 4 Parameter realizations describe ‘the different hand shapes, orientations, movements and positions in gesture space produced by speakers‘ (Bressem 2006: 4) With this description Bressem introduces the distinction between the category of the parameters and their actual realisation by gesturers. 5 ELAN (Eudico Linguistic Annotator) was developed at the Max Planck Institute in Nijmegen (www.mpi.nl/tools). 6 The feature “large” applied when the hand was stretched and/or the forearm was used during the performance of the circular motion. The feature “medium” refers to a relaxed hand; “small” applied when only one or more fingers were used. 7 For similar notions see, inter alia, Kopp et al. 2004, Lascarides & Stone 2006, Müller 2010b, Sowa 2006. 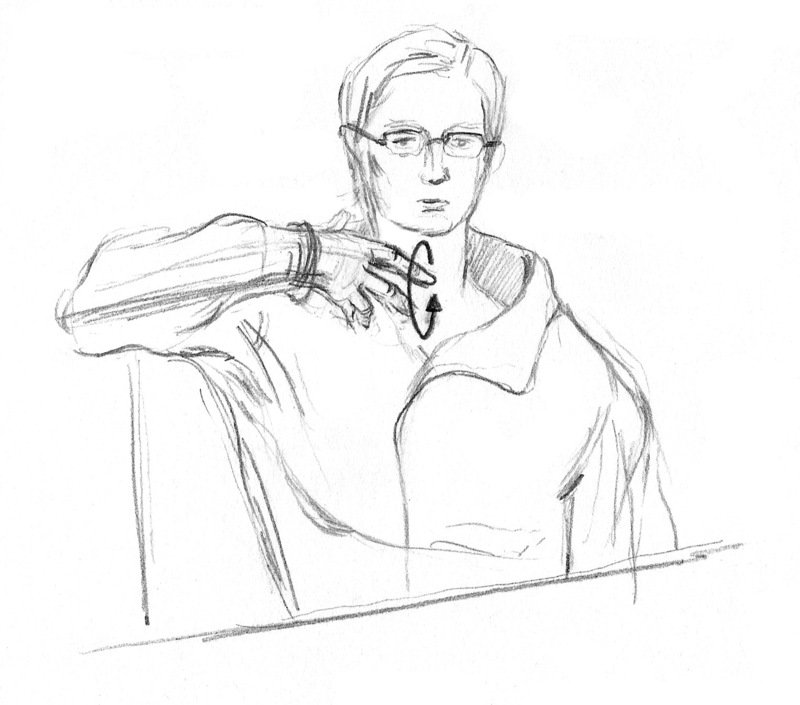 8 It could also be argued that the gesture is used to “crank up” the speaker’s ongoing searching activity. The fact that speakers giving a talk in front of an audience very often perform this context variant with a large movement size argues in favour of the interpretation given in the text. A large movement size ensures the visibility of this gesture. 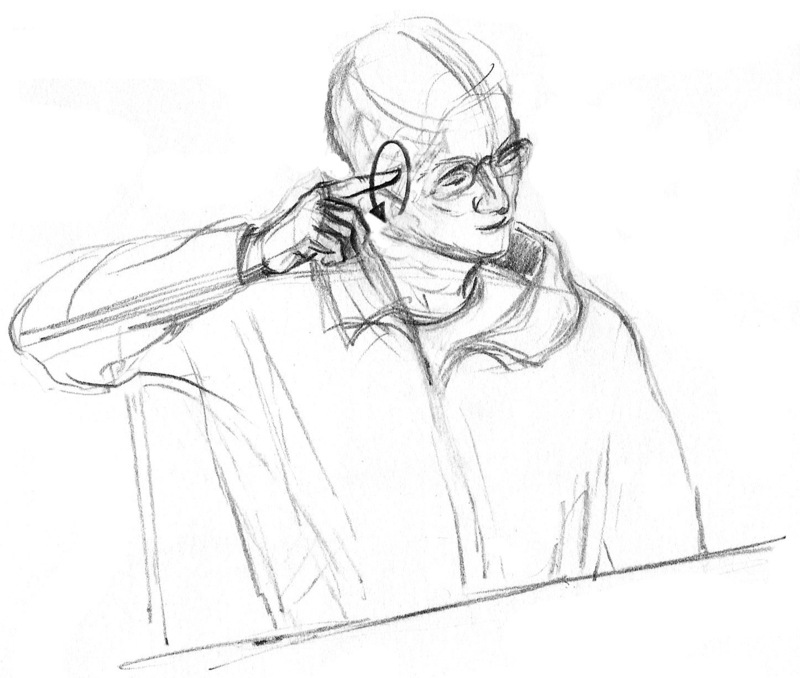 Accordingly, it seems to make more sense that the gesture is used in order to show that the speaker is searching for something than to show that s/he is cranking up his/her searching activity. 9 The speakers’ utterances are transcribed following the transcription system “GAT” (Selting et al. 1998) in line xx_sp (here Me_sp), translated in line xx_sp_tr and transliterated in line xx_sp_trl. The part of the utterance on which the stroke of the gesture is executed is marked bold. Line xx_gph shows the gesture phases of the cyclic gesture: ’prep’ refers to the preparation phase of the cyclic gesture, ’retr’ to the retraction of the hand/arm. The meaningful part of a gesture is termed ‘stroke’ but could also be a ‘hold’ (Kendon 1980). Line xx_hes contains annotations of hesitation phenomena such as ref_i=reformulation indicator, n=new start, ref=reformulation, l=lengthenings, p=pause. Accents are marked by capitals. 11 The presented order of the context variants in figure 9 reflects processes of conventionalization from the context of descriptions over word/concept searches to requests, spelled out in Ladewig (2010). 12 See inter alia Kendon 1995, 2004, Mittelberg 2006, 2010, Müller 2004, LeBaron & Streeck 2000, Teßendorf 2008. 14 This metaphor was also found in the data, for instance in an example in which a speaker is talking about digestion. 15 See inter alia Brookes 2001, Calbris 2003, Kendon 1995, 2004, Müller 2004, Neumann 2004, Seyfeddinipur 2004¸ Teßendorf 2008.